I get asked every now and then about creating a custom cover from other boxes, such as a liquor or wine box, that don’t come in four- or six-pack boxes. What I finally figured out is that they’re asking is if I can use the shipping cases that the larger bottles come in. Many times, the design of these boxes is pretty boring, maybe done in only one or two ink colors, since its usually only the distributors and drivers who see them, but I now have a little collection of the case boxes that I find interesting, and have experimented with producing custom books from them. 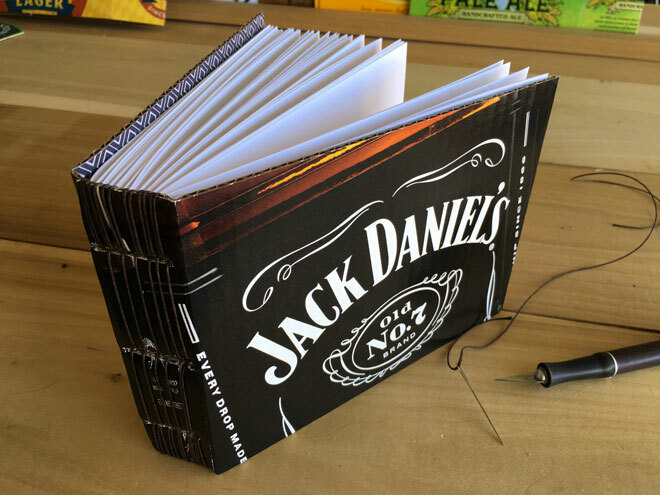 From a distance this custom Jack Daniel’s cover looks amazing, but upon close inspection, you can see strange folds and bends where the spine meets the front cover. Generally speaking, the thicker corrugated cardboard isn’t great for these. One would expect the thicker cardboard to be stronger, and therefore better, but it’s just not the case, in my opinion. The thicker covers protect the pages very well, the overall rigidity of the cover makes it feel like a hardback book, but the edges are two ply, and subject to dings and tears, even more so than the traditional thin boxes I’m using. Custom cover made from a Costco pre-made margarita box. Another issue I run into is that since the cardboard is thicker, with vertical lines running through them, the box will tend to fold where it wants to, not necessarily where I want it to, specifically where the front and back covers meet the spine. More often than not, they bend, as opposed to fold, which results in uneven lines and odd-sized covers. 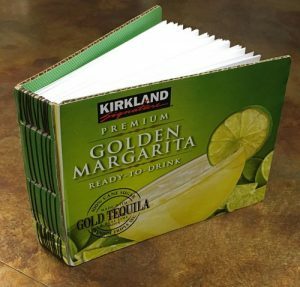 Every once in a while I’ll test one out that actually works, like this Costco-brand margarita mix box, but that seems to be the exception to the rule. Keep sending in custom requests through the etsy shop. I’ll absolutely keep experimenting with these types of boxes, because I know that if I can nail this down it will really open up some new options for custom work, but for right now, I’m not thrilled with the results. Custom journals – with lined pages!